The IFT Student Association (IFTSA) has over 2,500 members from around the world. When you join, you become a part of the largest and most important community of students studying food science and technology. Your career and leadership development opportunities are plentiful. Believe it or not, the first IFTSA newsletter was prepared on a typewriter in 1973. Since then, radical changes in design, layout, and content have resulted in one of the most attractive and readable newsletters within IFT. In addition, IFTSA has taken full advantage of social networking websites such as Twitter and Facebook to facilitate communication between former, current, and future members. What was once only possible at annual conferences and meetings – sharing photos, stories, and thoughts – IFTSA’s vibrant online community has made commonplace, accessible the world over. Much of the activity of today’s Student Association is centered upon our six competitions, held nationally each year. The first spark of competition flickered in 1974, during the Undergraduate Research Paper Forum at the IFT Annual Meeting in New Orleans. Shortly thereafter, under the leadership of Chairman Bill Edmunds, The Chapter of The Year Award was developed, with the University of Georgia first winning top honors. IFT Student Association members love science and have an everyday passion for food. 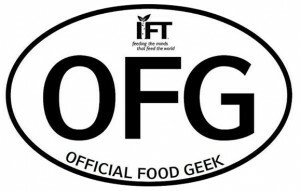 They are Official Food Geeks, and IFT is their home. My name is Daniel, I’ve been a long term reader of your blog and would love to work with you for one of my client. Your site has a high quality structure and value which will be beneficial for my client. I noticed that you’ve recently been publishing lots of great posts. I can provide posts that is not covered yet which your readers will appreciate or enjoy it well. sciencemeetsfood.org The content will be professionally written in line with your site’s theme and voice. we’d like to see if you are interested in working with us. . If you allow us, we would like to do content advertisement in your website maintaining the quality. Are you currently accepting guest blog posts? I write for food, beverages and would love for an opportunity to write for your audience.